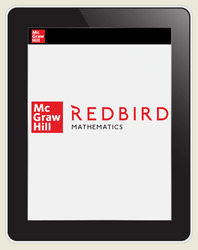 This is a 1-year, Student Edition subscription to Redbird Mathematics (priced per student). Please contact sales for multiple year subscriptions. Redbird Mathematics uses adaptive technology to meet all learners (grades K-7) where they are and accelerate learning. At its heart, Redbird Mathematics is an engaging program that enables students to understand, apply, and create at their specific point on the learning continuum.